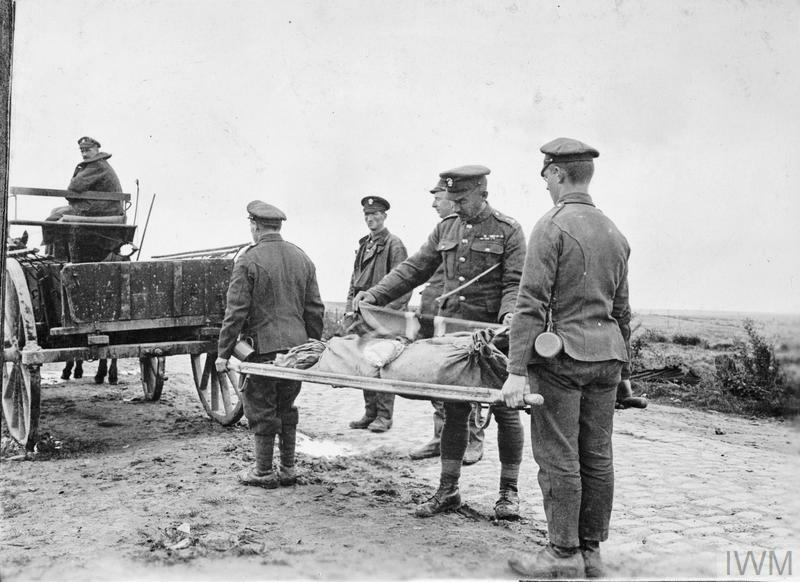 The Field Ambulances from the Royal Army Medical Corps were put to work in the war-ravaged landscapes of the Aisne, the Somme, Arras and Ypres; the broken bodies in their charge (above) were transferred to Saint-Pol-sur-Ternoise in northern France, and at noon the next day a battered military ambulance rattled its noisy way to the Quai Gambetta at Boulogne where HMS Verdun was waiting. The ship slipped anchor shortly before noon and ploughed through the mist across the Channel to Dover, where it rode outside the Western entrance before steaming along the southern breakwater to the Eastern entrance, like countless hospital ships before it, and finally made fast at Admiralty Pier. The train arrived at Victoria shortly after 8.30 p.m., where crowds had been waiting patiently for hours. In many ways it was a journey like all the others. 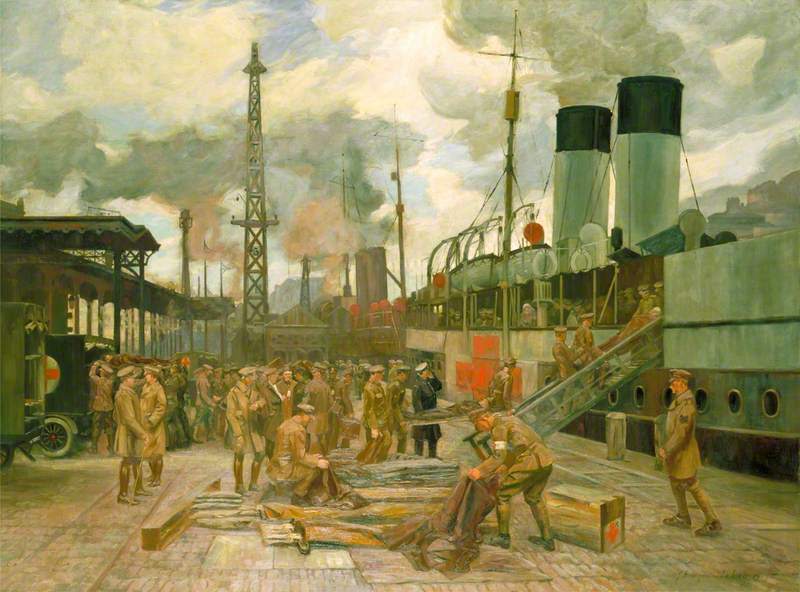 Between September 1914 and November 1918 hundreds of thousands of wounded soldiers from Britain and across its Empire had been rescued from the battlefields in Belgium and France, and many of the most seriously wounded had made the precarious crossing from Boulogne (below) and other ports to ‘Blighty’. 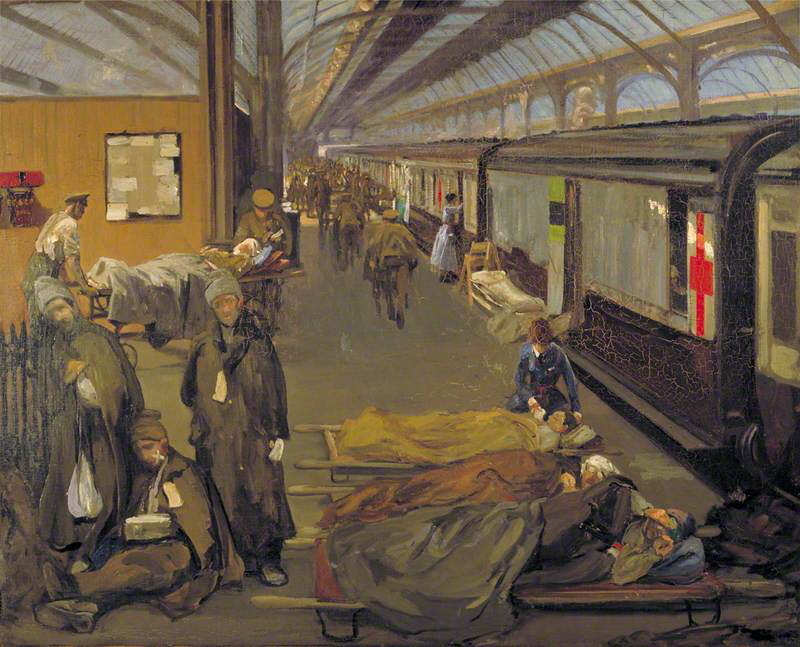 Along the permanent way, ‘all the women and children by the side of the railway were at their windows or in their gardens, waving their hands’ as the hospital trains thundered by. 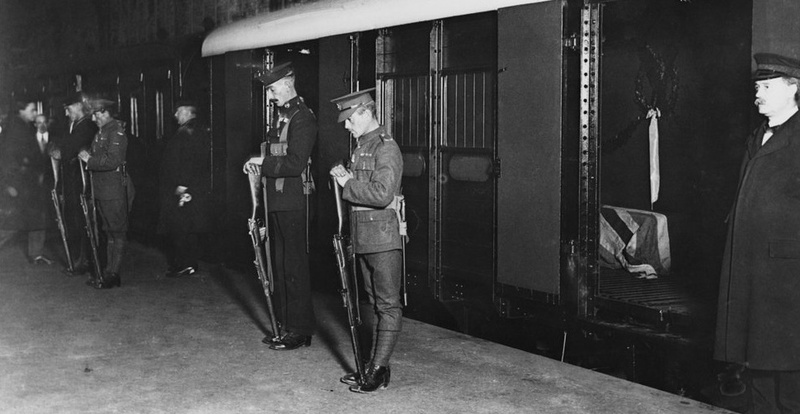 Yet this particular journey was no was no ordinary one, for those bearer parties had been deployed on 7 November 1920 and the special train arrived in London three days later. The body was that of the ‘Unknown Warrior’, selected from one of four that had been transported to the chapel at Saint-Pol – the other three, according to some accounts, were unceremoniously ‘tipped into a shell hole beside the road near Albert’ – and its journey ended with a solemn procession past Edwin Landseer Lutyens‘ newly inaugurated Cenotaph (which, true to its name, remained empty) and burial in Westminster Abbey on 11 November 1920. It was also, in its way, the long journey of all. Not many of those who were wounded made it back to Britain in four days, as I will show in a later post, but the chronology of the Unknown Warrior’s passage was deceptively protracted (and I use that adverb advisedly). 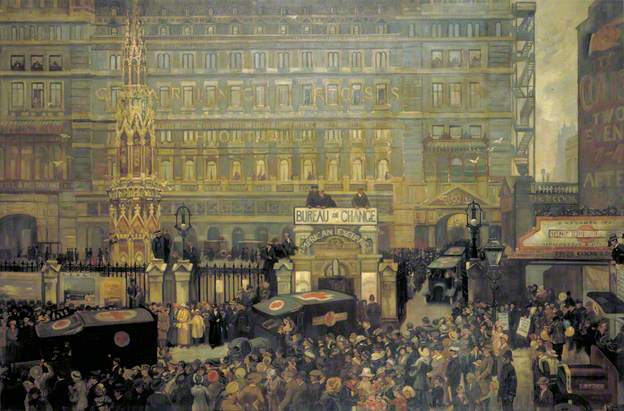 The intention was to allow grieving families and friends to believe that the Unknown Warrior could be their husband, lover, brother, or son, killed in any year of the war and drawn ‘from any of the three services, Army, Navy or Air Force, and from any part of the British Isles, Dominions or Colonies.’ Yet the Field Ambulances received secret instructions stipulating that the remains they recovered had to be of soldiers mortally wounded in 1914. 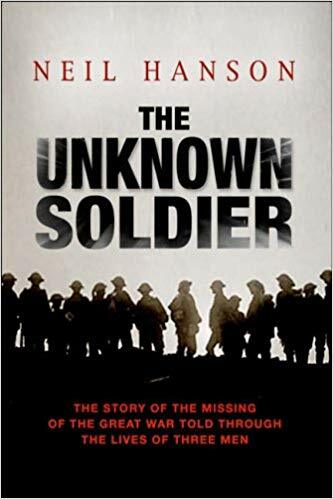 ‘For military traditionalists this also had the side-benefit of ensuring that the Unknown Warrior would be an Anglo-Saxon member of the British Expeditionary Force – a regular soldier – rather than one of Kitchener’s New Army of civilian volunteers or one of the hundreds of thousands of soldiers drawn from the far-flung reaches of the Empire’ (p. 432). But this is misleading: even in 1914 it was not ‘all white on the Western Front’; troops from the Indian Army arrived at Marseilles at the end of September, and the Lahore Division played a vital part in resisting the German advance in October and November around La Bassée and Neuve Chapelle. The passage of the Unknown Warrior was distinguished not only by its ceremony but also by its rarity. In the first months of the war the bodies of some servicemen who had been killed were returned to Britain, but these were private arrangements that were abruptly terminated by an official order in April 1915 forbidding exhumation or repatriation (reaffirmed by Haig in a General Routine Order in December 1917). As a result precious few of Britain’s war dead made that final journey home: most were buried close to where they died, and their bodies were eventually gathered into military cemeteries across Flanders and northern France, at first by the British Red Cross Society’s Mobile Unit and then by the units of the Graves Registration Commission attached to the Army Service Corps (later the Imperial War Graves Commission). ‘A land whose loneliness is so great that it is almost frightening. 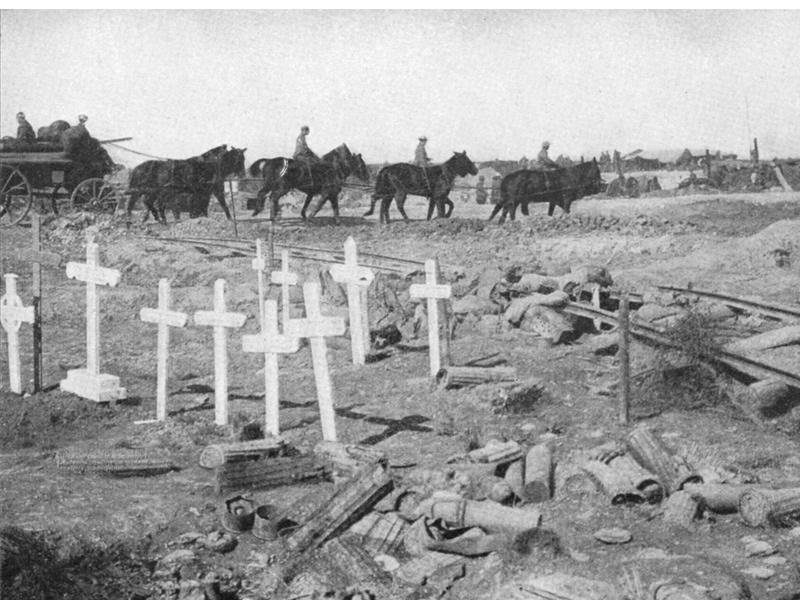 A land of wooden crosses, of which, wherever you may stand, you can count numbers dotted about, each indicating a soldier’s grave, and the spot where he fell. ‘The names of the dead,’ Feilding continued, ‘are generally undiscoverable’ – and it was this sober realisation, and the sight of a grave outside Armentières in 1916 marked ‘An Unknown British Soldier’, that gave an army chaplain, the Reverend David Railton MC, the idea of a collective memorial in London. 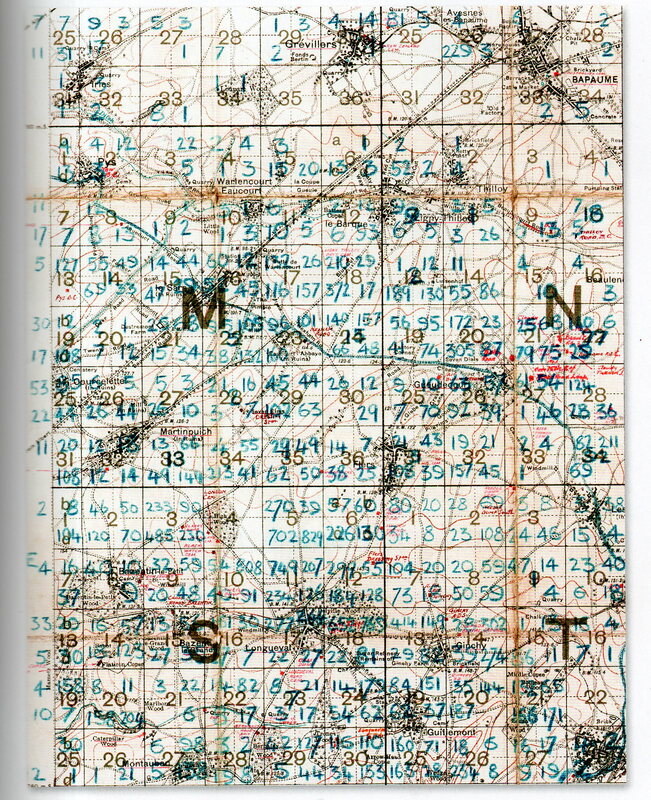 As Feilding’s letter makes plain, the scale of the slaughter would have made identification and repatriation immensely difficult, but the decision was plainly prompted by more than practicality (though the task of keeping track of the dead was formidable in itself: the image below is an extract from a ‘body density map‘ produced by the Directorate of Graves Registration and Enquiries after the war; it records, grid square by grid square, the number of bodies recovered from just a fragment of the Somme battlefield before their reinterment in military cemeteries). But the decision to forbid repatriation was more than a matter of logistics or even cost. Reading lists of officer casualties in the Times was sober enough – and only officers’ families received the dread telegram; the families of other ranks had to wait for a form letter – but it would have been a far cry from the effect of seeing the physical return of so many dead. The debate was not settled by the end of hostilities, and a politics of repatriation continued to swirl around the landscape of memorialisation. 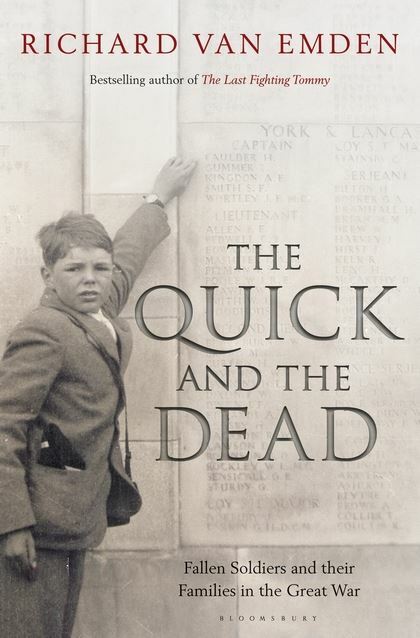 (You can find much more in David Crane, Empires of the Dead: how one man’s vision led to the creation of WWI’s war graves (London: Collins, 2013) and the brilliant Richard van Emden, The Quick and the Dead: fallen soldiers and their families in the Great War (London: Bloomsbury, 2011). It is those numberless dead who haunt the collective memory of the First World War: the white crosses in military cemeteries, the black names on war memorials, and all those nameless, placeless bodies represented by the Unknown Warrior. That is understandable; but behind the remembering is a forgetting. John McCrae’s elegiac poem ‘In Flanders Fields’ is recited on Remembrance Day every year – ‘In Flanders fields the poppies grow, between the crosses, row on row’ – but he wrote those lines on 3 May 1915 to commemorate the death of a close friend who had been buried the night before, and he did so sitting on the tailboard of an ambulance at Essex Farm Advanced Dressing Station near Ypres. 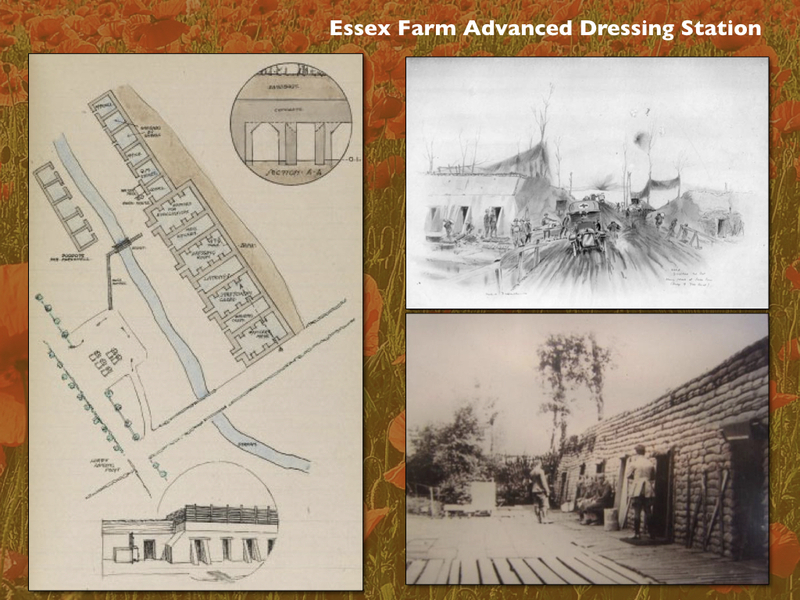 How many remember that McCrae was a Medical Officer with the Canadian Field Artillery, who knew better than most that what lay behind his haunting lament – and beyond his medical post dug in to the side of the Yser canal – was a vast field of wounded men? It is those other journeys – of the wounded bodies and the woundscapes through which they moved – that are the central focus of my research on the First World War. And, as regular readers will know, I extend that analysis to the deserts of North Africa in the Second World War, to Vietnam, and to Afghanistan, Gaza and Syria in our own troubled present. Later modern war is far from disembodied. This entry was posted in casualties, medical geography, United Kingdom, World War I and tagged First World War, Neil Hanson, repatriation, Richard van Emden, Rowland Feilding, Somme, Unknown Warrior, war graves, wounded by Derek Gregory. Bookmark the permalink.